Marisela from the Liberty Science Center made static electricity and used it to attract Rice Krispies to a balloon with the help of two student volunteers. Andrew poured liquid nitrogen into boiling water, resulting in a LOT of condensation! 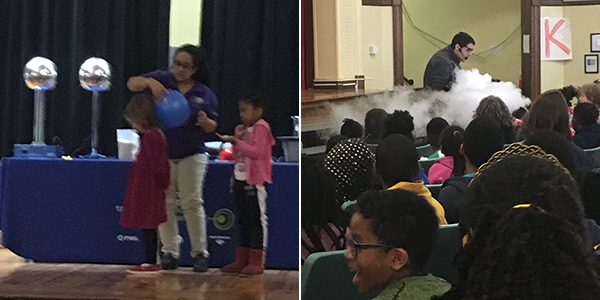 Students watched, and several participated, as Marisela and Andrew, two of LSC’s Traveling Science Program presenters, taught us about various aspects of static electricity, states of matter, air pressure, and temperature. Everyone got to see Rice Krispies fly in reaction to static electricity, watch air pressure crush a soda can, and learn what happens when a balloon goes into a vat of liquid nitrogen (hint: think pancake). Assemblies like this are funded by the PTA and are a great compliment to the curriculum. This entry was posted in Events, PTA, Seth Boyden News. Bookmark the permalink.